Deciding to undergo orthodontic treatment and selecting an orthodontist near Wentzville MO is an important decision for you and your family. You want a smile that looks and feels better, and it’s important to know what to expect from start to finish. When it comes to orthodontic treatment, the main goal is to provide you with a straighter, healthier smile. Here are some helpful tips from our Wentzville orthodontist on what to expect and ask at your first orthodontist visit. Our award-winning Wentzville orthodontist understands that every patient is different. Your treatment should be chosen primarily based on your medical needs, but that doesn’t mean other factors can’t be considered as well. Ask your orthodontist how different treatment options will affect your physical comfort, your appearance, and your financial needs. That being said, an experienced orthodontist in Wentzville MO should be able to provide you at least with a general expectation of how long your treatment will take. Some Wentzville orthodontic offices are also able to provide accelerated treatment options for some patients. Once your Wentzville orthodontist recommends the best treatment plan for you, you will be provided a recommended schedule. You should anticipate frequent visits to your orthodontist, so be sure to choose an orthodontic office in Wentzville MO that makes you feel comfortable! Evaluate Your Wentzville MO Orthodontist While They Evaluate You! Your first visit is about fact-finding, education, and planning. At Borello Orthodontics, we know that in order to select the orthodontic treatment option that is best for you, you will need to understand your current condition and all of your treatment choices. 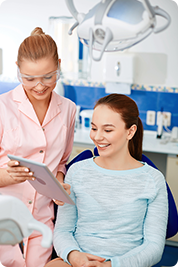 If you visit an orthodontist in Wentzville who doesn’t make you feel 100% comfortable with your treatment options, then don’t hesitate to schedule a second opinion with someone else.